The notice that greeted us upon entering Borders. Eventually, one of Dean's prizes. Andy enters the signing area. Andy looking at the tabletop, telling us he's overwhelmed. Andy starts to open up. Listening intently to a question. Andy explaining how to "cut" a record deal. Start of the keyboard lesson. Andy on how to get the perfect keyboard chord every time via cardboard cut-outs. Lemur Andy with the flash in the shades. A look back at the crowd with the home stretch in sight. Full frontal Andy. God looks in from the right. Dean Zemel starts his quality time, explaining his tee-shirt to Andy. Adam Osterman looks on from background right. Dean talks up Ben Gott's CD; Adam ensures dorsal photographic coverage from the background. 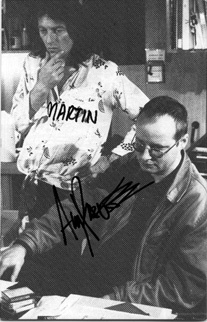 Andy signs Dean's 34th copy of "Apple Venus Volume 1." Dave Franson talks to Andy about the Partridge/Newell pic on the back of a "Little Express." Dave whips out his "Hello CD" single. Andy says "Some Lovely" will be on AV II. 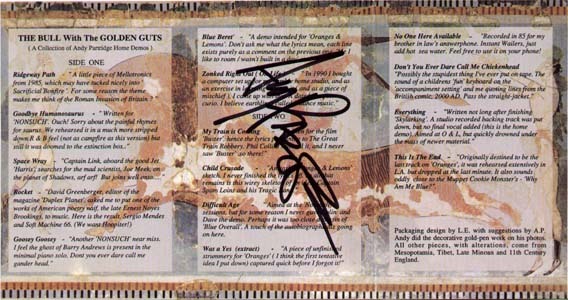 Andy signs "The Bull With the Golden Guts" insert. Dave explains the printout of "The Nonsuch Colouring Book" page. Andy signs Dave's AV I insert. 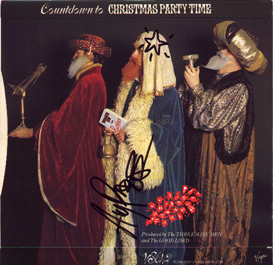 Andy signs "The Three Wise Men" single. Neither Andy nor Dave can remember which King of the Orient Andy represented, so Andy signs as Andy. Dave maniacally thanks Andy for all good things. Giordano's Pic I clockwise from 7:00... Dean, Fran, Jerry Kaelin , Jennifer Geese, Kate Burda, David, Adam, Steve Wade. Giordano's Pic II clockwise from 7:00... Jennifer, Kate, David, Adam (obscured), Steve, Dean (obscured), Fran, Jerry. Giordano's Pic III clockwise from 7:00... David, Adam, Jerry, Jennifer, Kate, Steve, Dave, Dean. Giordano's Pic IV clockwise from 7:00... David, Adam, Jerry, Jennifer, Kate, Steve, Dave, Dean.